my pictures from saturday evening are now part of a story at nowpublic.com. this afternoon i got an email from clorenz41  through flickr. he asked if he could use my photos “for a few stories that have been sent in”. the mail included some fancy link which made the whole process work automagically. 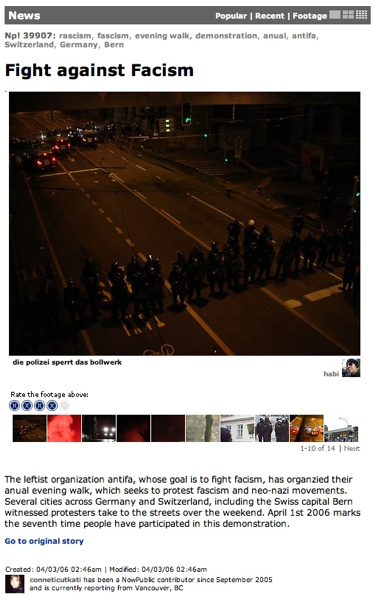 so after some clicks my pictures are now part of a story from conneticutkati , where she quotes another article on indymedia.ch. if you want to read the post at nowpublic, then click here or take a look at the screenshot on the left. if this is happening more often, maybe i should start to take money for my images? Congrats! You made a few very good pictures about the demo! Were you inside or just at the borders (before and after)? wie ein deutsches fernsehen sagt: mittendrin statt nur dabei. aber nicht bis ganz zum schluss, denn wie gesagt: randale ist scheisse!